At Walnut Valley Association we take client privacy seriously. This document outlines the way in which we collect, record and use personal information from site visitors. 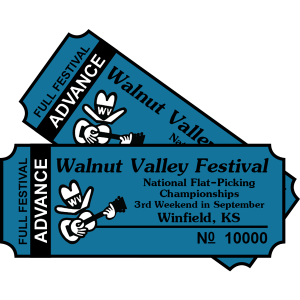 Walnut Valley Association organizes the annual Walnut Valley Festival, held in Winfield, KS. Our website address is: https://www.wvfest.com. WVA follows a standard procedure of using log files. These files log visitors when they visit websites. The information collected by log files include internet protocol (IP) addresses, browser type, Internet Service Provider (ISP), date and time stamp, referring/exit pages, and possibly the number of clicks. These are not linked to any information that is personally identifiable. The purpose of the information is for analyzing trends, administering the site, tracking users’ movement on the website, and gathering demographic information. Like any other website, wvfest.com uses ‘cookies’. These cookies are used to store information including visitors’ preferences, and the pages on the website that the visitor accessed or visited. The information is used to optimize the users’ experience by customizing our web page content based on visitors’ browser type and/or other information. While you are shopping on our site we track products you’ve viewed, location, IP address, browser type to show you products you’ve recently viewed and estimate costs such as taxes and shipping. When you place an order we collect your name, billing address, shipping address, phone number, credit card/payment details (which are processed through a third party), and optional information such as special notes for orders. This is necessary for us to process your payment and fulfil your order. We will also store comments or reviews, where applicable, if you choose to leave them. Information from Ticket Orders is added to an in-house database, which is used to generate mailing lists for our Walnut Valley Occasional, mailed by U.S. Post in December and July. For ticket orders, we use a third party to process credit cards, and credit card information is stripped off before we receive the ticket orders. Visitors who choose to provide their name and e-mail address (“Send me newsletters and important updates”) are added to a list of people who may receive by e-mail notices of special deals, electronic versions of the Walnut Valley Occasional, or important updates about the Walnut Valley Festival. These communications include the option to opt out, or be removed from our e-mail mailing list, usually at the bottom of the message. Information submitted through the “Contact Us” form is used to address a visitor’s question or concern and includes the visitor’s name, email, and any information the visitor chooses to include in the message. Information collected from this form is not used for marketing purposes. We will not sell your personal data to third parties. We do not share your personal data without your permission with third parties, except as necessary to provide services previously described in in this policy such as credit card processing, sending e-mail newsletters, and collection of analytics. Data submitted through our website is stored on servers in the United States. Credit card information submitted through this site is processed by a third party and is not saved on our servers. The in-house database we use to track ticket orders is a stand-alone database and is not linked to the internet. This data is stored in the United States. No method of internet transmission or electronic storage is 100% secure and we cannot guarantee absolute security of data.